Significant historical events include the Russian Revolution (1917). Among births to note are Italian painter Giotto (1267), Dutch Humanist Erasmus (1467), Jonathan Swift (1667), David Garrick and Horace Walpole (1717), Henry David Thoreau (1817), novelists Arnold Bennett and John Galsworthy (1867). 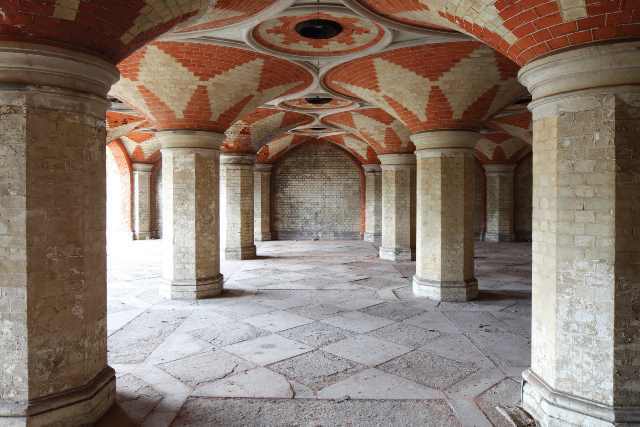 Also born in 1867 were dramatist Luigi Pirandello, children’s book illustrator Arthur Rackman and sports coach & Herne Hill resident Sam Mussabini. Births in 1917 include Anthony Burgess, Arthur C Clarke, Eric Hobsbawm, Carson McCullers and John F Kennedy. Jane Austen died in 1817, as did opera singer & Herne Hill resident Anna Storace. Poet Charles Baudelaire died 1867; actor-manager Sir Herbert Beerbohm Tree and WW1 poets Edward Thomas and Arthur West died in 1917. Notable deaths in 1967 include author and editor J R Ackerley, who was born in Herne Hill, playwrights Joe Orton and Elmer Rice, poets John Masefield, Dorothy Parker, Carl Sandburg and Harlem Renaissance poet and dramatist Langston Hughes. The Friends of Carnegie Library invite you to come to TEA WITH SHAKESPEARE. A celebration of Shakespeare’s Birthday in Words & Songs Performed by The Friends’ Musick in period costume. Directed by Marilyn Harper. Refreshments provided and all voluntary contributions gratefully accepted. The event will be opened by the Mayor of Lambeth at 3.30pm. 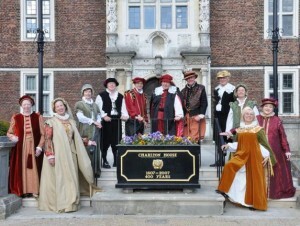 Tea (Elizabethan style) will be served from 3pm. 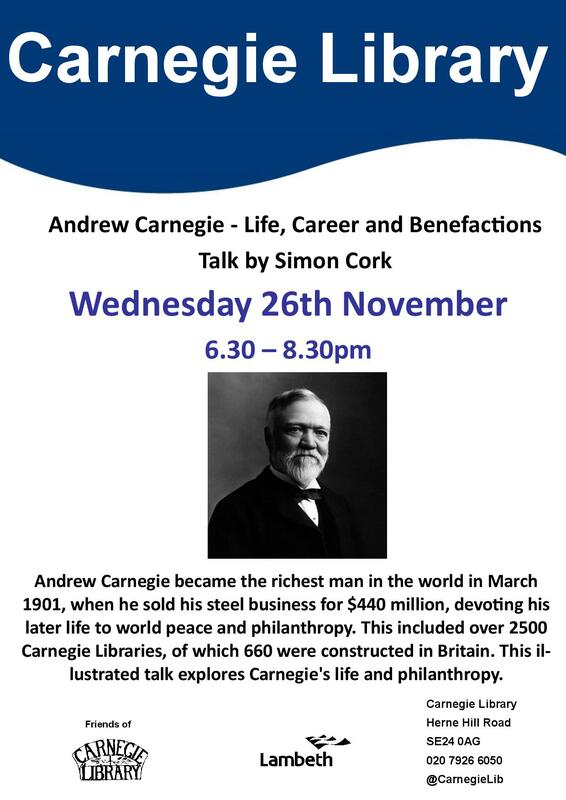 Andrew Carnegie became the richest man in the world in March 1901, when he sold his steel business for $440 million, devoting his later life to world peace and philanthropy. This included over 2500 Carnegie Libraries, of which 660 were constructed in Britain. 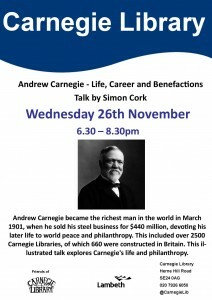 This illustrated talk explores Carnegie's life and philanthropy. 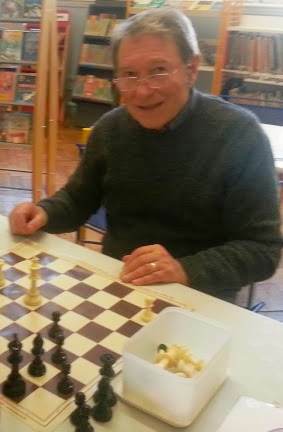 The Carnegie Chess Club was established by Edward Ochagavia in 2000 when the Library was under threat of closure. He was keen to make the library not just a place for books but also to bring people living in the area together socially and stave off the threat. He learned to play when he was growing up in the Soviet Union where chess is almost a way of life and wanted to pass on his enjoyment of the game. His passion for chess lies in the game's ability to enrich your intellect. Whether you lose or win, you will improve your logical thinking, planning and strategising skills, social sportsmanship, and mental discipline. These skills are transferable to many of life's challenges such as mathematics, philosophy, science, technology, project management, and achieving your goals. The Carnegie Library is one of the few libraries in London to have a dedicated, quiet, and secluded outdoor space to facilitate a peaceful and relaxing reading experience. Join in the lull of the wind in the trees, the birdsong, and the ambience on one of the garden benches, smoke a pipe even, while reading the daily papers. In 2007 Lambeth Libraries, in partnership with the Friends of Carnegie Library and Lambeth Parks, were awarded a grant from the Breathing Places Big Lottery Fund to create a ‘Reading Garden’ at Carnegie Library. This ambitious project, which opened up the currently unused garden at the back of the library for storytelling, reading, and quiet contemplation, was launched on 7 July 2007 by Jeffrey Doorn from the Friends of Carnegie Library. He was joined at the launch by Library Manager, Laura Chrysostomou, Dr Ian Boulton, Lambeth Bio-diversity Officer, and support was given by author and restaurant critic, Jay Rayner. With the help of volunteers the first phase of the project, to clear the ground and prune back the overgrown shrubs, was successfully completed. Following structural work the garden was opened to the public on 3 May 2008 by the Mayor of Lambeth, one year from the beginning of the project. The garden holds events, a gardening club for children, and a sensory garden with Braille signing. For more information on Green Spaces in Lambeth visit the Parks and green spaces pages. 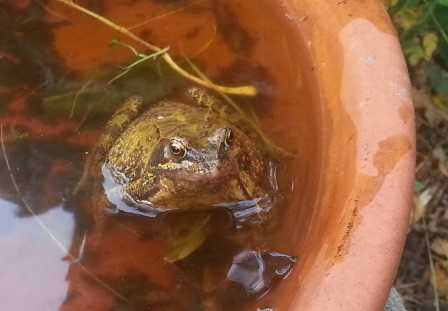 For more information on rich wildlife in Lambeth please visit the Wildlife and biodiversity pages. You can find some wildlife books in Lambeth Libraries by visiting the Online Library Catalogue.